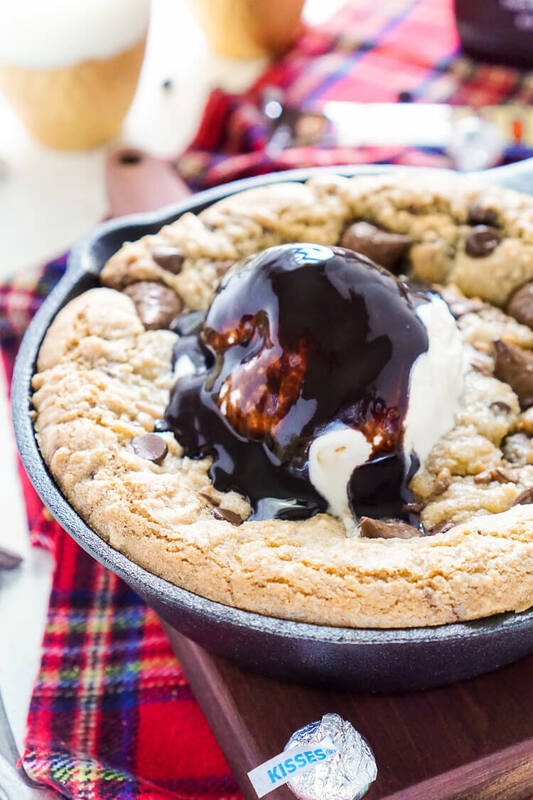 This Chocolate Toffee Skillet Cookie is the ultimate family dessert! 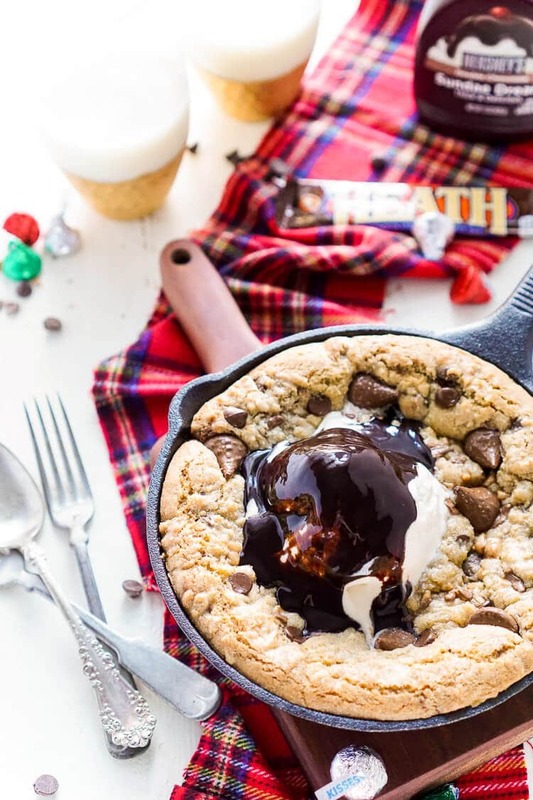 Layers of chocolate and bits of toffee are folded into a cookie that’s baked in cast iron and topped with ice cream and hot fudge. 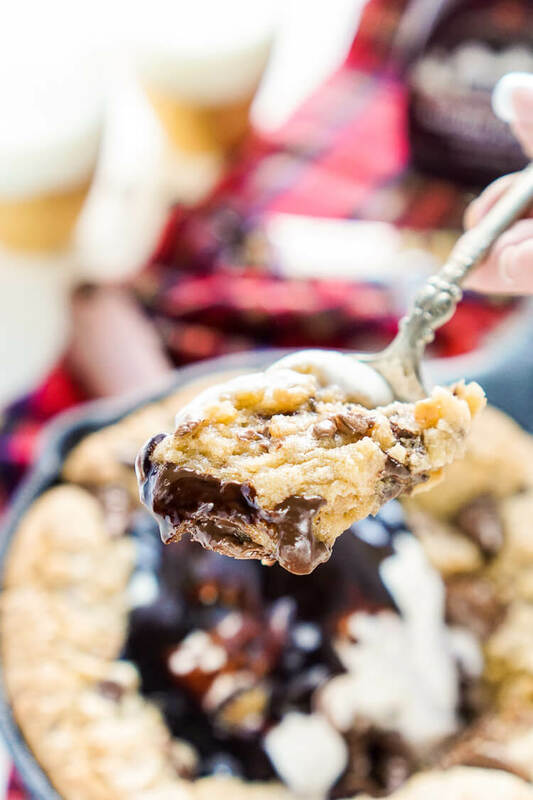 When the holidays and the snow hits, there’s nothing I want more than to snuggle up on the couch with my husband and dog, a full queue of movies, and a decadent dessert that’s loaded with chocolate chased down with a glass of milk. I think that’s the best part about winter, those days when you’re snowed in and all you want is some serious comfort food and cuddles. And for me, those pajama days are a tradition all their own. Nothing screams comfort quite like something cooked in cast iron. A well-seasoned cast iron skillet is a tradition keeper, it carries memories of family dinners and camping trips long gone by and it holds onto a little hint of each of them to share with the next thing to grace its seasoned surface. Basically, cast iron = love. And you know what makes love grow stronger? Hershey chocolate! True story. 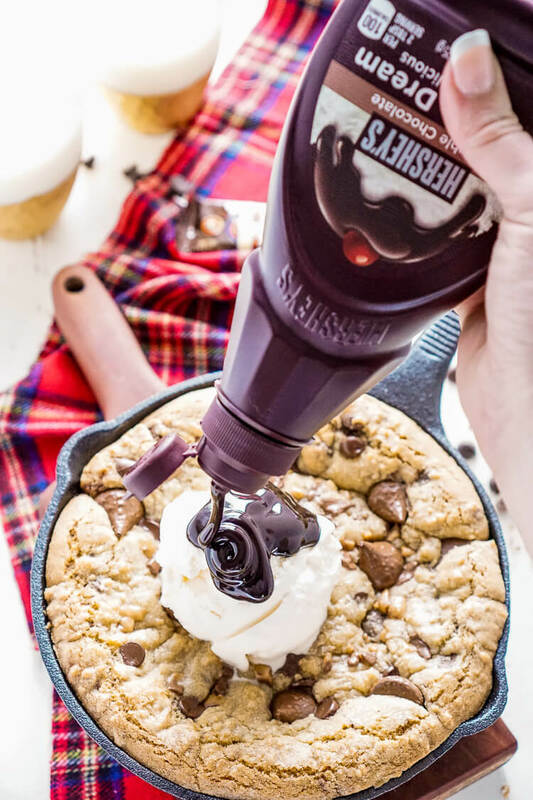 From Hershey’s Kisses to Hershey’s Semi-Sweet Chocolate Chips, to their chocolate fudge sauce, this skillet cookie is loaded up with all the chocolate goodness you can imagine. Toss in some of their Heath Toffee Bits and this dessert is MONEY. I mean, you probably can’t buy much with it, but I bet you can buy your kid’s silence for as long as it takes them to eat it and that’s something right? It can probably also buy pure happiness too, which means you can skip the gifts this year and just make everyone skillet cookies. No one will be disappointed… PROMISE! What I love most about this dessert is that it’s something you can make and eat together. And by together I mean everyone legit takes up their spoons and dives into the ooey gooey goodness that is this cookie! It’s the perfect dessert for the night you put up the tree, or you could even make it for Santa (he’s had enough sugar cookies)! Remember, holiday recipes don’t all have to have peppermint in them or be shaped like reindeer. What makes holiday recipes so special is that they’re something the whole family loves, they’re something the kids will want to make with their own years down the road. What holiday traditions do you have and which ones do you hope to start? Is The Hershey Company a part of those traditions? Find some magic this holiday season and don’t forget to reward yourself with the good stuff. i.e. 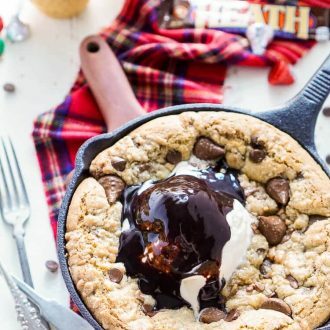 this chocolate toffee skillet cookie! 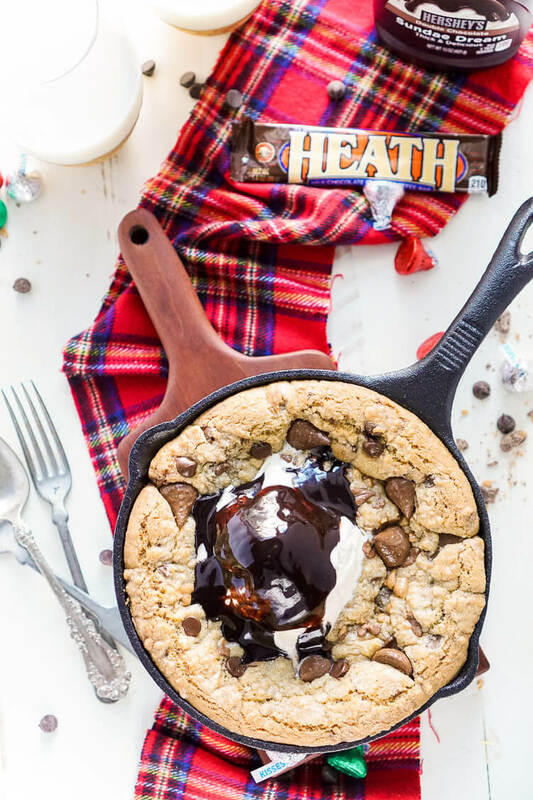 This Chocolate Toffee Skillet Cookie is the ultimate family dessert! 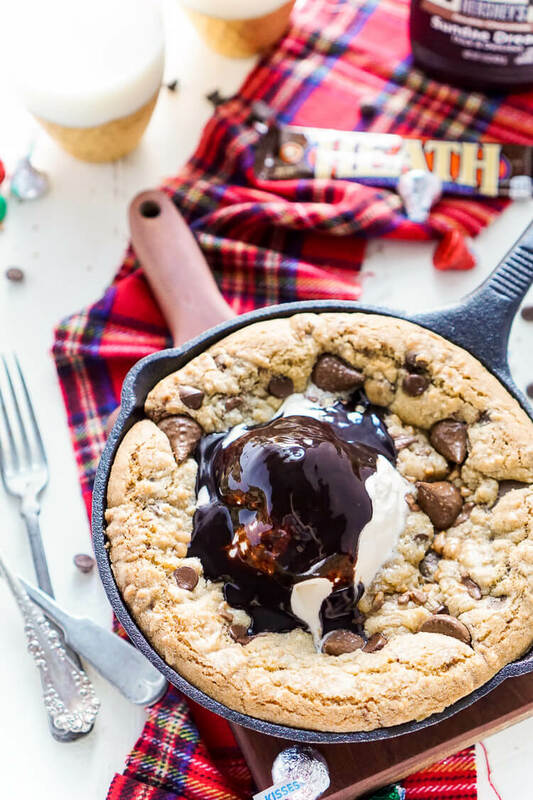 Layers of chocolate and bits of toffee are folded into a cookie that's baked in cast iron and topped with ice cream and hot fudge. Preheat oven to 350 degrees F. <g class="gr_ gr_154 gr-alert gr_gramm undefined Grammar multiReplace" id="154" data-gr-id="154">Place</g> an 8 inch cast iron skillet in the oven to heat up. In a large bowl or stand mixer, cream <g class="gr_ gr_153 gr-alert gr_gramm undefined Punctuation only-ins replaceWithoutSep" id="153" data-gr-id="153">butter</g> and sugars until light and fluffy. Beat in egg and vanilla just until combined. In a separate small bowl, combine flour, baking soda, and salt. Slowly add to sugar mixture a little at a time until fully combined. Add in chocolate chips and toffee bits and mix until combined. Remove hot skillet from oven and add dough to it, gently spreading it out over the pan being careful not to burn yourself. 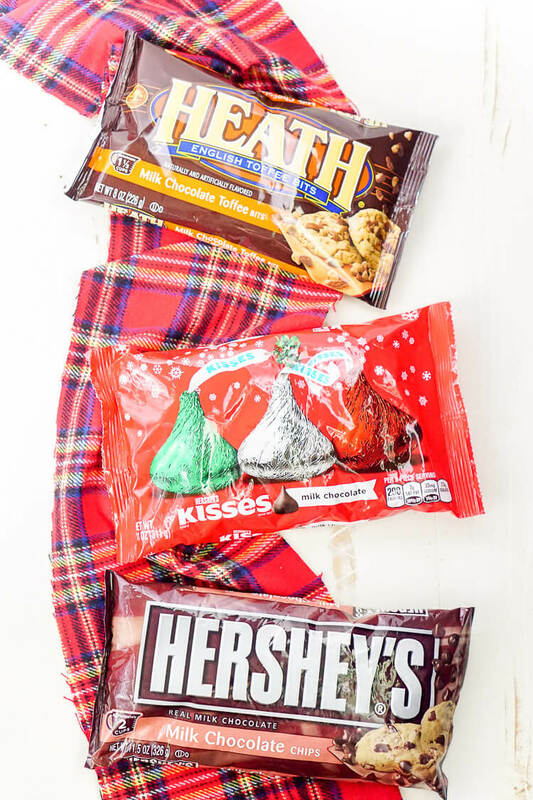 Press Hershey Kisses Milk Chocolate Candies into the top of the cookie dough and bake for 15-20 minutes until edges are golden brown. Top with ice cream and hot fudge and everyone dives into the hot pan with their forks and spoons! Mouthwatering! 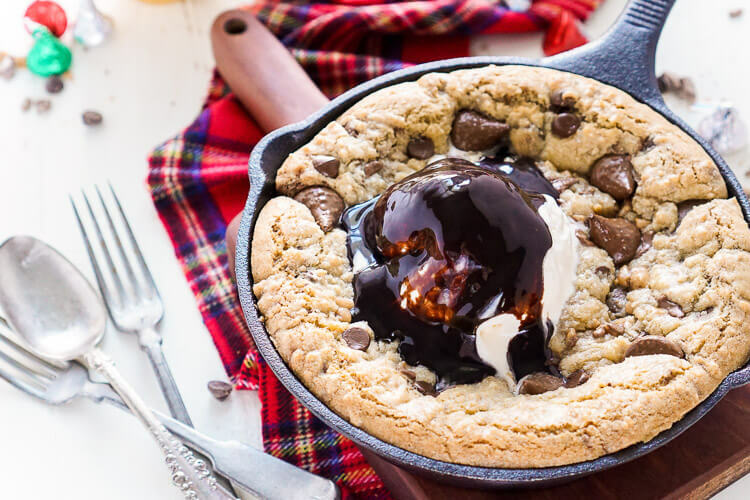 I suddenly like to make desserts using my skillet. Maybe this is the first one I’m doing. Thanks for sharing!